When Spike first appeared and we (the audience) learned that he had a previous connection with Angel, I admit, it never once occurred to me to wonder about exactly what kind of a relationship the two might have once had. My becoming a Spike/Angel 'shipper though I can blame on two wonderful fic writers: Saber ShadowKitten and Spirit. Their wonderful stories introduced me to the unique 'rightness' of this pair and now I'm hooked. According to Joss, Drusilla is Spike's sire as Angelus is hers and yet I kinda like the idea of Spike being the childe of Angelus. But who are we, the audience, to argue with the God known as Joss? There are several reason why these two fit together. 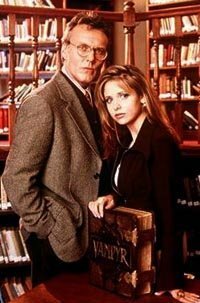 The main reason being they are both vampires; they share an undeniable understanding about one another's natures, an understanding which Buffy could never hope to have. Another reason stems from the current literary belief that vampires are sexual creatures who will, in Spike speak, 'shag' anyone, add in the fact that these are two very beautiful men and voila instant slashy goodness. Of course, there are probably people out there who are looking at me with disgust, unable to see the inherent beauty of this pairing, but to each his own. You'll find some Spike/Angel fiction at ...Mightier Than the Sword. It started with five simple words: "Ours is a forbidden love." From there it has moved into a small, but devout, following. Willow and Angel, age and wisdom combined with youth and innocence. Like many my first real taste of these two was Melinda Dawney's story Friendship and that was it, I was hooked. Now I find myself writing fiction just for them and altering stories I'd previously started so that they'll have a Willow/Angel connotation. Want some Willow/Angel fiction? Go to ...Mightier Than the Sword. She's the Slayer; he's her Watcher; together they are an unbeatable team. Now this pairing I've been interested in since the beginning of the series. They just seem to mesh, at least in my mind they do. I know some of you are probably going 'gag' over the idea of these two together but I've thought, right from the start, that they were perfect for one another. Plus, I've never liked the idea of Buffy and Angel together. With the return of Angelus, Drusilla proved how fickle a woman she was. So eager to please her 'daddy', Drusilla often left a now injured Spike by the wayside. As a result, Spike chose to help the Slayer stop Angelus' opening of a gateway to hell. Spike, who happened to like the world the way it was, helped Buffy because of his love for Drusilla and his fierce desire to protect her. As I recall I liked the idea of these two as a couple before they ever got together on the show. The street wise thug and the small town princess. I don't really know why, but almost from the start when Gunn became a regular member of the Angel Investigations team, I enjoyed the interaction between these two characters and have always liked the idea of the two of them becoming a couple. While I liked both Doyle and Fred and the interactions with Cordelia and Gunn respectively, I still prefer the joining of Gunn and Cordelia more. It took a while for the idea of these two together to seem right to me. Once it did though, I embraced the idea of Wesley and Faith full force. The episodes of Angel where Wesley got her to help with Angelus and the Beast helped to fully cement my liking for this pairing.